Samsung Galaxy S9 Vs OnePlus 6: Which Is Better To Buy? OnePlus 6 was the much anticipated smartphone for OnePlus fans. With the launch, it unveiled outstanding features and created buzz all around for its fast processing. Simultaneously, Samsung Galaxy S9 is giving a tough competition to OnePlus 6 due to its hi-tech features and amazing performance. Now, when it is about buying an Android smartphone, this competition is definitely giving tough choices to the buyers. To serve an ease, we are here to help you compare Samsung Galaxy S9 and OnePlus 6. Samsung S9 and OnePlus 6 are neck-to-neck when it is about design. Made up of glass body, both the smartphones are boasting the glossy look. 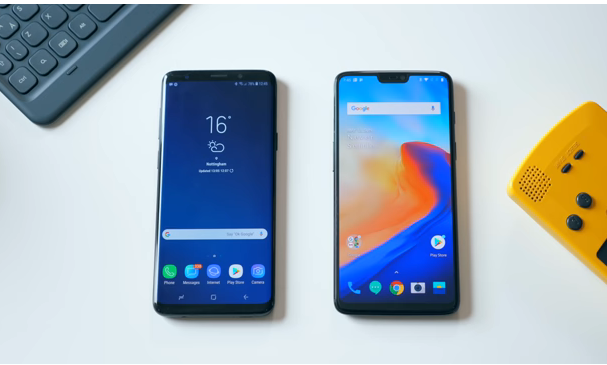 Only difference between them is the curve within OnePlus 6 at the rear side. Aside, its appearance, Samsung Galaxy S9 adds a plus one to its performance, as it rates high at water-resistance test. While, OnePlus 6 brought an improvement over OnePlus 5, but still its lagging behind Samsung S9. Unlike other revolutionary smartphones, both of these carries USB – C port and headphone jack. At the rear, they both have fingerprint scanner which gives ease of accessibility. Edge-to-edge screen is trending these days, following which Samsung S9 and OnePlus 6 has trimmed bezels around it. And, yes, the ‘notch’ which may be disappointing for some users is present in OnePlus 6, whereas Galaxy S9 cropped it from its design. There is no branding logos at the front and the home button is absent too. And, the good news is, both the devices are available in different stunning colors. OnePlus 6 has variants of Matte and Shiny in Black and White, while Samsung S9 is available in Gold, Grey, Black and Purple. Those who are looking for convenient handling, Samsung Galaxy S9 is the must go smartphone. It boasts 5.8 inches curved screen, while OnePlus 6 is featuring the huge screen of 6.28 inches. With Galaxy S9, the users will get AMOLED Capacitive Touchscreen, whereas OnePlus 6 gives Super AMOLED quad-HD display unit. And, when it comes to brightness, Samsung S9 markes 1000 nits on the scale and wins the ground. Featuring the powerful processor – Snapdragon 845/Exynos 8910, Samsung Galaxy S9 and OnePlus 6 have been introduced as the fastest Android smartphones. OnePlus 6 comes with 6GB/8GB RAM, while Samsung S9 comes with 4 GB RAM. Immense storage is made available within both the smartphones. Galaxy S9 and OnePlus 6 are available with different memory storages – 64 GB/128 GB/256 GB. Camera is the real factor that brings a mammoth difference between Samsung Galaxy S9 and OnePlus 6. Galaxy S9 is carrying an outstanding package of video camera, 12 MP variable aperture camera and excellent editing features. Simultaneously, its front camera is 8MP which captures the perfect selfie. Talking of OnePlus 6, it features two rear cameras – 16 MP + 20 MP. While the front camera is 16 MP. Employing OIS as an advantage, both the devices captures perfect pictures in daylight as well as dim light. Also, they perform equally for video recording. Both, Galaxy S9 and OnePlus 6 can record 4K 60fps videos which is great. Battery within Samsung Galaxy S9 is 3000 mAh, whereas OnePlus 6 has 3300 mAh battery. Fast charging is featured by both the phones. However, Galaxy S9 supports wireless charging, while OnePlus 6 supports USB-C charging. Samsung Galaxy S9 is a bit expensive than that of OnePlus 6. $1084/ €915 / Rs. 72,900 for 256 GB. While, OnePlus 6 costs approx. 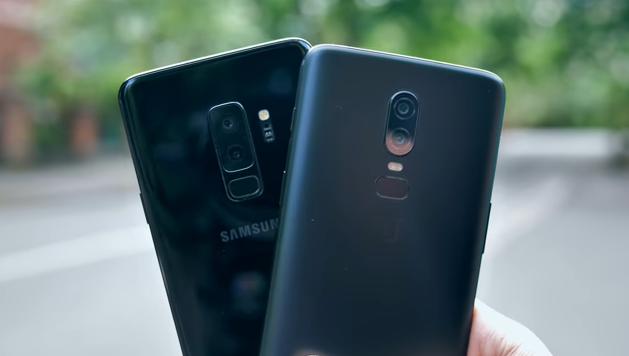 Samsung Galaxy S9 Vs OnePlus 6: Which One Is Better? Starting from appearance, none of them is dominating, instead both carries appealing design. And, moving towards its processing, Samsung S9 and OnePlus 6 are again giving a tough competition to each other. Both of them performs super-fast due to Snapdragon 845 processor. When the real parameter is considered – the price; Samsung Galaxy S9 is obviously expensive as that of OnePlus 6. However, OnePlus 6 lags on the rating scale of water-resistance test and wireless charging. Also, OnePlus 6 does not have high-resolution display, stereo speakers and HDR support. Summing up, Samsung Galaxy S9 is the phone for you, if you are fine for paying extra for some extras. While, if those extras does not make a lot of difference for you or you are looking for a mid-range smartphone, OnePlus 6 will be the perfect choice for you.